A tribute to a caller simply known as "Fred"
BLACK TALK radio in Philadelphia is often an over-the-back-fence kind of conversation. 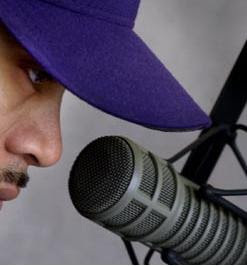 For at least three decades, the African-American community has exchanged the latest news, gossip or social outrage daily on WDAS, WHAT or WURD. The strength of black talk is that it is an essentially private within-the-group dialogue in a public venue transmitted on a radio frequency. Miss Ann (the Penn Fruit Lady), Leon Williams, Beverly, Brittany, Miss Ruth Helen, Pam Africa, Hannibal, Hotep, Wayne Moore, Barbara Jean Hope, Ron from North Philly, Ron from Nicetown, Rob from Mount Airy, Brother Rob, Brother Kentu, Brother Okane, Mr. Willie, Sister Dee, Sister Carol, Sister Aminah Hotep, Louise (Mommy) Hannibal, Mr. Osiris, Big Jim from West Philly, Darrell Hinton, Leola, Joey, Jerome Avery, Momma Sally, Carl, Mr. Knox, Sacaree Rhodes, Rev. Joe, Miss Laurie, Mr. Peel, Miss Bell, Flagman . . . and then there was Fred. Last week, just hours after calling Reggie Bryant's radio program on 900 AM WURD, Fred suffered a heart attack and died at age 53.